Today’s professionals want more. They expect their employers to invest in their growth and development and are hungry for skills acquisition and training, a thriving culture, rewards and recognition, and life beyond work. These needs raise an important question for companies looking to hire top talent: what should be at the core of a successful hiring strategy? The answer lies in two words: employer branding. Simply put, employer branding is the process of marketing your company as an employer of choice by creating a positive image, or reputation, and showing the company as a great place to work. Companies that understand the importance of this era of digitization and transparency are also concerned with their employer brand. Branding a company as an employer of choice has important implications for attracting and retaining the best talents. Organizations that want to win the war for talent should not only aspire to become a great place to work; they should aim to be perceived as one too. A proof of the importance of employer branding is the fact that job seekers everywhere are looking up information about companies they are targeting. According to the Bayt.com What Makes a Company an Attractive Place to Work? poll, February 2014, nine out of 10 professional respondents in the Middle East research a company online while considering a job offer, and 75.6% of respondents in the Bayt.com Trends in Employer Branding in the Middle East poll, conducted by business facilitation company Naseba and Bayt.com in June 2016, say they usually check a company’s online profile before applying for a job at that same company. Being perceived as a great place to work results in better employee engagement, according to 23.4% of respondents in the Trends in Employer Branding in the Middle East poll. 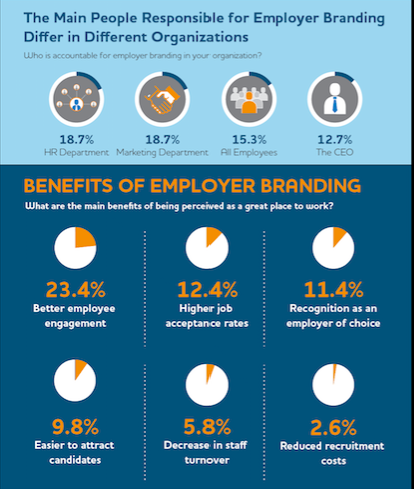 In fact, better employee engagement, higher job acceptance rates and recognition as employer of choice, all emerged as the top benefits of employer branding, according to the poll. The fact is, forging a compelling corporate identity, or employer brand, will not only spark candidate interest and trust, but will also help to engage candidates with the brand and, if done right, have a great employee join your company. Wellness programs go beyond traditional health insurance to offer gym memberships, nutrition counseling, anti-smoking programs, and other programs to improve health and well-being. According to the Bayt.com Health and Lifestyle in the Middle East poll, March 2016, 96% of polled respondents believe it is the employer’s responsibility to promote employees’ health and wellness. Top candidates are often self-starters who can handle the responsibility of setting their own schedules and choosing when and how to work. Flexible hours, telecommuting, and work-from-home options can all play a role. The point here is to help employees balance stress by offering holiday parties, retreats, or other perks, like sports and team-building activities. A well-appointed break room can also help relieve stress at work and give top talent a place to do their best creative thinking. A rewarding workplace helps boost people’s love and passion for their jobs. Be sure to align the potential hire’s future benefits with the success of the company. Performance- based compensation is one of the best ways to get top talent at a low base. If they add value for the company, set it up that they are rewarded for that value. The companies that are going to be most successful moving forward are the ones that understand the importance of lifestyle balance. Whether it’s the ability to work from home or more vacation time, millennials expect a lifestyle balance much more so than the older generations. The millennial generation is digital, and more and more candidates today scrutinize corporate websites while evaluating job offers. Make sure yours is a winning one. This is not simply a matter of using the right graphics, colors, backgrounds and formats; you need to make sure your vision, mission statement, values and culture are all very clearly articulated. Show potential candidates why they would want to join your organization. Include photos, videos and biographies of your existing staff and management and keep content up-to-date to make your online profile even more compelling and your job vacancies even more in demand. When visiting a company website or corporate profile, respondents in the Trends in Employer Branding in the Middle East poll listed the features they would love to see. These include “reasons to join” (32%), the “vision, mission and values of the organization” (9.5%), “testimonials and actual experiences from employees” (8.4%), “company awards” (4.2%), and a “letter from the CEO” (4%). Recognizing the need for optimal employer branding through digital storytelling, Bayt.com has come up with a solution for companies looking to brand themselves as employers of choice: Premium Company Profiles. Premium Company Profiles by Bayt.com are simply a way for companies that are aware of the importance of branding in the digital age to create a crisp and effective brand among so many other brands fighting for talent. Companies large and small can now personalize their own corporate profile and use it to update their information, as well as share their job vacancies, and celebrate their culture and milestones with our community of over 25 million job seekers. The job interview represents the perfect setting for you to convey an exemplary image about your company. Do be on time, do be professional, do be friendly and most importantly, do put the interviewee at ease. Remember, you are not simply making a mere business transaction; you are aiming at recruiting a “relationship” before recruiting an “employee”, and solid recruiting relationships translate into an even more solid employer brand, regardless of whether the candidate gets hired or not. 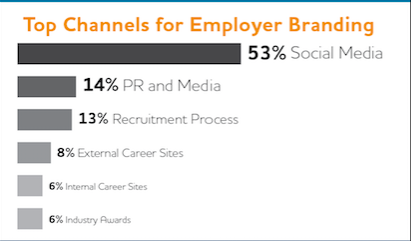 A systematic approach to funneling candidates and communicating effectively with them is essential for successful employer branding. 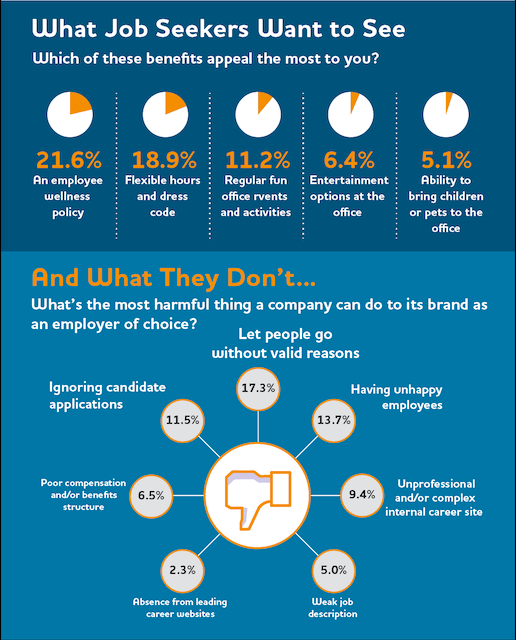 Six in 10 professionals agree that no follow-up or communication by the company after applying is the most harmful thing that could happen to an employer brand, as revealed in the Bayt.com What Makes a Company an Attractive Place to Work? poll, February 2014. It’s important for businesses to invest in an applicant tracking solution that enables them to seamlessly manage their candidate pool. Bayt.com’s Talentera, for example, serves as a comprehensive recruitment solution; it helps companies create branded career channels to source, track, assess and hire candidates, right through their own corporate websites. Nothing can boost an employer brand better than having existing employees willingly want to brag about your organization! Satisfied employees often tend to volunteer to tell stories about their company’s unrivaled success, unique culture, and exquisite bundle of values. Bayt.com, for example, has an official “Ambassador of the Year” award where employees who actively promote the Bayt.com brand receive special accolades and a certificate of appreciation from the CEO. Make your employees happy: reward them when due, support them when needed, and leave the doors open for communication at all times just so they know they can come to you for both positive and negative feedback. Transparency, integrity, support and gratitude are what talents are after in their quest for their ideal employer today. Finally, the last ingredient in the formula for attracting and retaining top talent is innovation in recruitment marketing. Hosting virtual job fairs, for example, is an excellent way of engaging potential employees in a vibrant and sophisticated online environment that can yield immediate results. Bayt.com hosts a series of Virtual Job Fairs (vFairs) across the region. These recruitment fairs offer a great opportunity for professionals from around the world, who are looking for a job in the Middle East, to get in touch with top regional employers directly. The online platform is ideal for regional employers who are looking to attract top talent, at a fraction of the cost of a traditional job fair, and from the comfort and convenience of their own corporate offices.